The water here in Bryan, TX is soft, but stinks of chlorine. I finally decided to put together a water filter for my growing brewery. I got the specs from the January 2007 issue of Brew magazine. They have yet to put that article online, so here it is. I built it for about $40, but you can probably do better. The Culligan WHR-140 filter is intended to be used in a shower head, so you get much better throughput than a faucet filter. The manufacturer says it is good for 10,000 gallons, or about 770 ten-gallon batches. It is good at removing chlorine, sulfur and heavy metals. I got mine from Amazon for about $20 delivered. You can get that down to $14 if you find it locally. 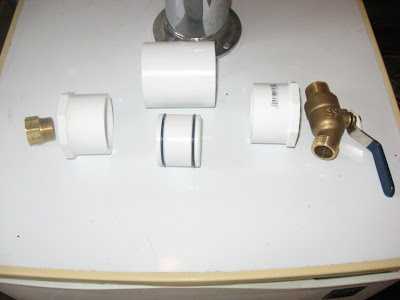 If you want to cut costs, switch out the hose-bib adapter (a $7 part) for a the corresponding MPT x male garden hose adapter. 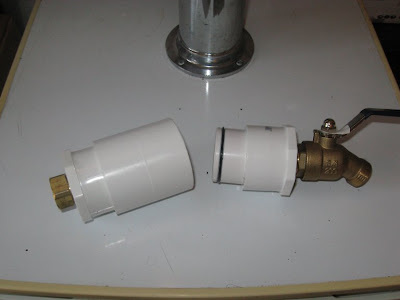 It makes a compact filter and the full-port ball-valve is a nice way to save running around to the spigot. When I water-tested the assembly, the backpressure was enough to blow the thing apart, so I plan on checking out threaded bushings. Failing that, I will glue one bushing in and strap the whole thing together. Great how-to! Here’s to 770 batches of beers! 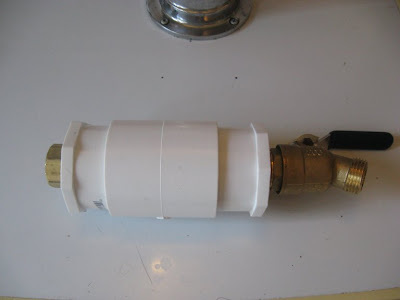 I glued the entire housing together to keep the thing from exploding when the hosebib is closed. After 770 batches of beer I’ll replace the PVC.